Bringing Traditional Indian taste, Evergreen Sweet House has been enthusiastically engaged in offering mouth smacking Snacks and Sweets. To tickle the taste buds, we have opened the gateway to Ready Made Snacks, Indian sweets, namkeen etc. We believe in the concept of “Trying is believing”, thus we prepare snacks and sweets to suit everyone’s requirement. Besides being a symbol of true taste, our snacks and sweets also assure health. 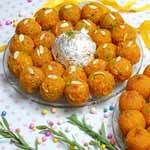 Today, we have carved a niche as one of the prime Indian Sweets Manufacturers and suppliers based in India. Our 100 % vegetarian food items are highly acknowledged for long shelf life, unmatched flavor and freshness. Being a time-tested organization, we assure to give the full value of the money of the client. The quality of our snacks and sweets has assisted us in winning the heart of huge clientele based in India, USA, UK, Italy, Germany, Kuwait, Australia, New Zealand and many other countries. Timely delivery of the snacks and sweets is the sphere, where the company specializes.